The Monk Moses Murin lived during the Fourth Century in Egypt. 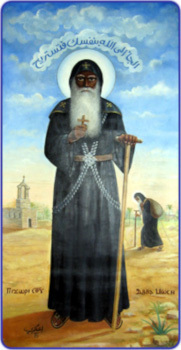 He was an Ethiopian, and he was black of skin and therefore called “Murin” (meaning “like an Ethiopian”). In his youth he was the slave of an important man, but after he committed a murder, his master banished him, and he joined in with a band of robbers. Because of his mean streak and great physical strength they chose him as their leader. Moses with his band of brigands did many an evil deed – both murders and robberies, so much so that people were afraid even at the mere mention of his name. Moses the brigand spent several years leading suchlike a sinful life, but through the great mercy of God he repented, leaving his band of robbers and going off to one of the wilderness monasteries. And here for a long time he wept, beseeching that they admit him amidst the number of the brethren. The monks were not convinced of the sincerity of his repentance; but the former robber was not to be driven away nor silenced in demanding that they should accept him. Accounts about his exploits spread amongst the monks and even beyond the bounds of the wilderness. The governor of the land wanted to see the saint. Having learned about this, the Monk Moses decided to hide away from any visitors and he departed his own cell. Along the way he met up with servants of the governor, who asked him, how to get to the cell of the wilderness-dweller Moses. The monk answered them: “Go on no further to this false and unworthy monk.” The servants returned to the monastery, where the governor was waiting, and they conveyed to him the words of the elder they had chanced upon. The brethren, hearing a description of the elder’s appearance, all as one acknowledged that they had come upon the Monk Moses himself. Having spent many a year at monastic exploits, the Monk Moses was ordained deacon. The bishop attired him in white vesture and said: “Abba Moses is now entirely white.” The saint answered: “Master, what makes it purely white – the outer or the inner?” Through humility the saint reckoned himself unworthy to accept the dignity of deacon. One time the bishop decided to test him and he bid the clergy to drive him out of the altar, whilst reviling him for being an unworthy Ethiopian. With full humility the monk accepted the abuse. Having put him to the test, the bishop then ordained the monk to the priesthood. And in this dignity the Monk Moses asceticised for fifteen years and gathered round himself seventy-five disciples. When the monk reached age seventy-five, he forewarned his monks that soon brigands would descend upon the skete and murder all that were there. The saint blessed his monks to leave in good time, so as to avoid the violent death. His disciples began to beseech the monk to leave together with them, but he replied: “I many a year already have awaited the time, when upon me there should be fulfilled the words which my Master, the Lord Jesus Christ, did speak: All, who take up the sword, shalt perish by the sword.” (Mt. 26: 52). After this seven of the brethren remained with the monk, and one of these hid not far off during the coming of the robbers, The robbers killed the Monk Moses and the six monks that remained with him. Their death occurred in about the year 400.